Having the entire family together should be a joyous day that doesn’t bring on the stress of figuring out how to afford it. Thanksgiving dinner can feel very costly though, with a large meat entree and lots of sides. But no one wants to break the bank in exchange for making memories. 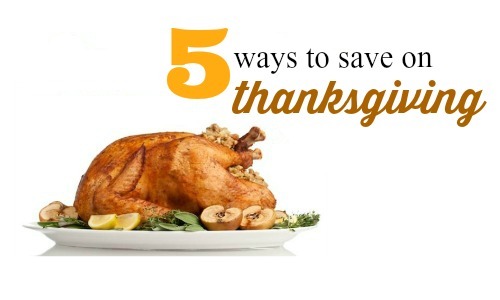 Here are some easy ways to save on every part of your Thanksgiving dinner! Many stores will price match each others prices on turkey the weeks before Thanksgiving. Use the item search feature on Southern Savers to see who has the best price on fresh or frozen turkey and then see if your local store will match that price. We should also see printable coupons come out to use with your best price. Don’t forget to also look for incentives. We usually see gas savings through fuel-perks with any turkey purchase. We’ve even seen Office Depot throw in a free turkey with any $125 online order this week, so who knows what other incentives will pop up! Go ahead and make your menu now so that you know what you will need. It may be a few weeks away, but who doesn’t love thinking about all of your favorite meals! Plan out not only all the meals and ingredients needed, but also all the non-food items you will need, paper goods, things to get the house ready. As you plan also make a note off to the side on items that can be cooked ahead and frozen (or at least assembled and frozen). We make most casseroles a week or so early and freeze them until the night before. It makes for a super clean kitchen the day of! One item on my list every year is disposable baking pans! I love stocking up so I don’t feel guilty at all not scrubbing pans all afternoon!! Once the menu is made, it’s time to see if any guests would be up for helping to cook. Most folks love to bring something, so either ask them to make something on your menu or see if they want something you didn’t think of. By breaking up the cooking list you are also decreasing your out-of-pocket expense! If you have family members that don’t like to cook how about asking them to bring the paper goods or drinks. According to advice experts like Dear Abby, It’s considered rude to not ask for help and try to cook it all yourself! We are already seeing key ingredients on sale or buy one get one at various grocery stores. Since you already made your ingredient list, start grabbing those items a little each week following the sales. Starting to shop now will save you from paying top dollar for items you have to get to make your favorite dishes. This is another time to use the item search feature on Southern Savers to see exactly where things you are need are on sale this week. If there are items that you want that aren’t on sale yet, you could also set up an item alert for them and get an email when they do go on sale. Having a plan now of what you want to do with your leftovers helps to stretch your savings even further. You’ve spent money on the meal (even if it was a fraction of what you would have spent) you might as well not throw all the savings away! The list can go on and on! Also make sure you are set on storage containers and bags, those will be on sale over the next few weeks before Thanksgiving too. Do you have any other ways that you save on Thanksgiving dinner? ?